At the risk of sounding like an imperialist, ranch dressing just may be the greatest invention our country has given to the world. You’re welcome, world.Somehow in recent history, this humble condiment has gone from a salad staple to an accompaniment of chicken wings, pizza, French fries, you name it. It’s a wonderful blend of tang and creaminess, herbs and onions…well, it should be in theory. A lot of ranch sauces are insipid and heavy, or pretty bland, and while the original, Hidden Valley, is arguably the best bottled version out there, I’m hard pressed to think of a close second. But what if you made your own, and not only made your own, but used it as a dressing for that equal of American classics, potato salad?! 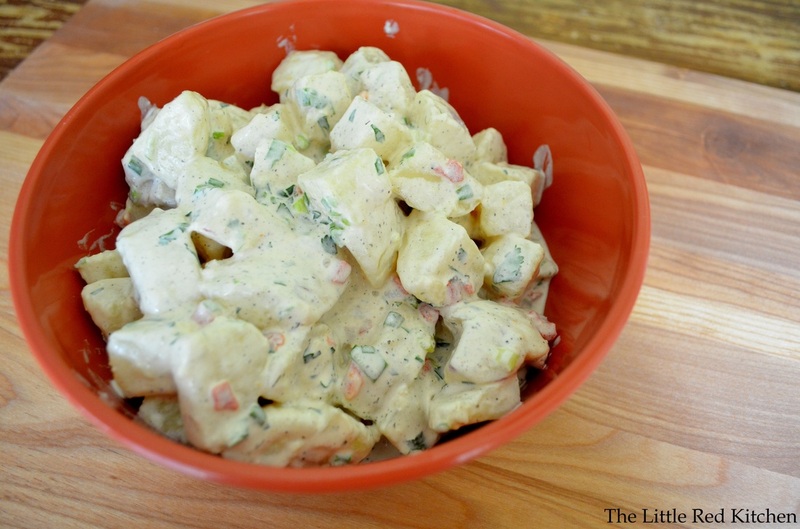 I wanted a delicious and easy side dish to cook up for my Labor Day feast, and thanks to the good folks at Cook’s Country, I got one in Ranch Potato Salad. 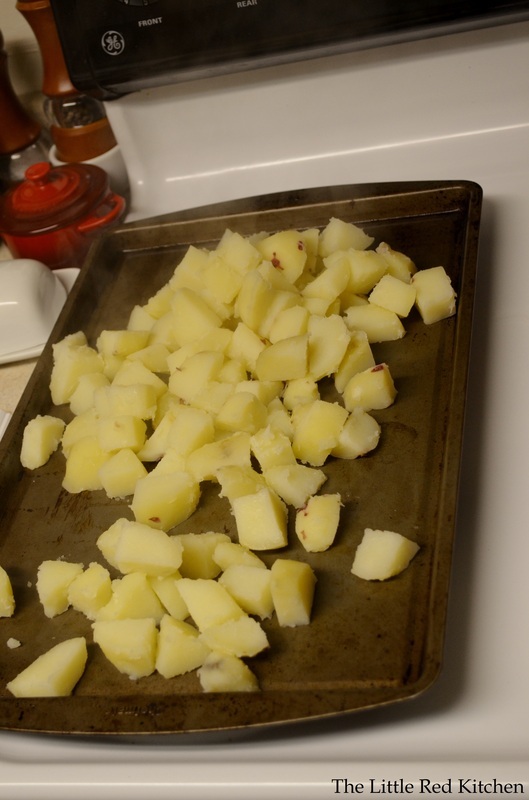 Put the potatoes in a pot and fill with water, enough to cover the potatoes by about an inch. Bring to a boil, then reduce heat to medium and simmer for 10 minutes, until the potatoes are tender but firm. 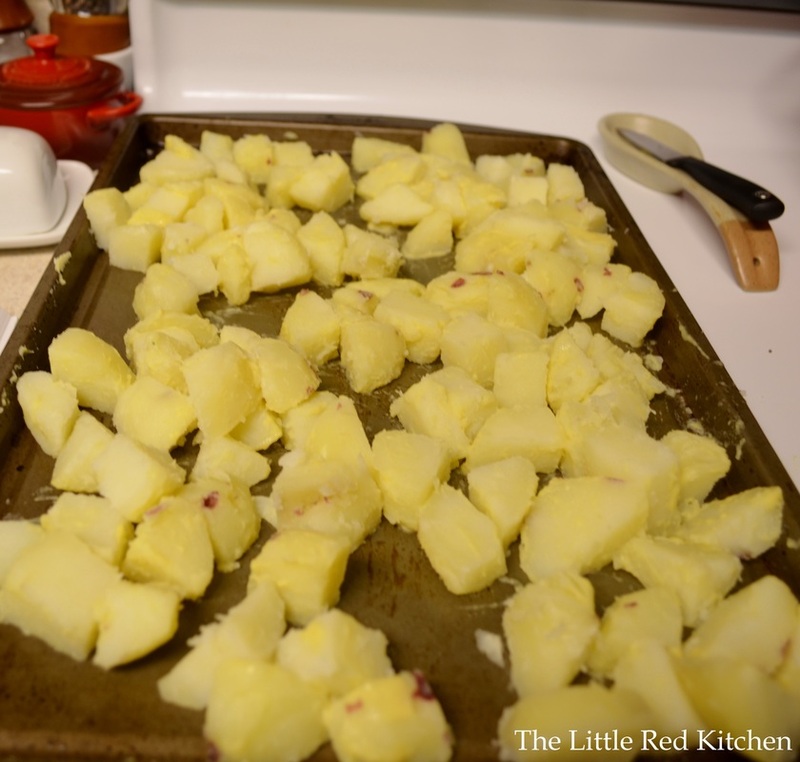 A good test is, slide a paring knife into a potato chunk; it should go through cleanly and easily but the potato should not be falling apart or crumbling. While the potatoes are simmering away, prepare the dressing. 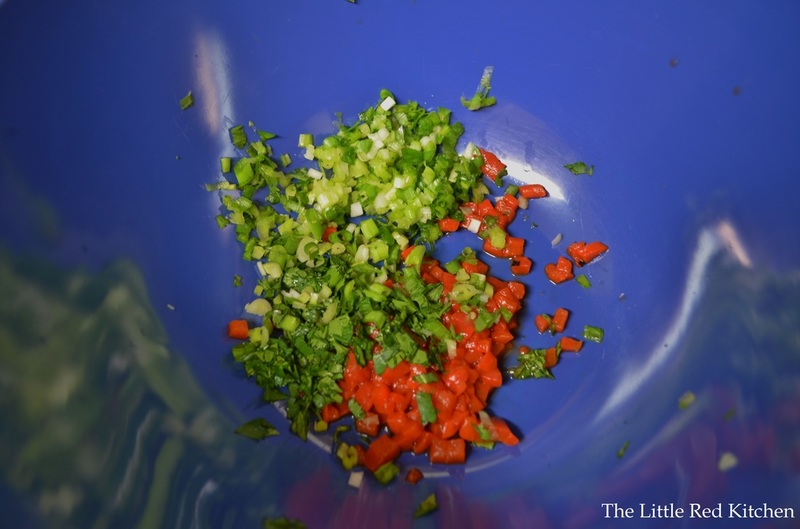 Add the chopped peppers, cilantro, and scallions to a large bowl. Add the mayonnaise, buttermilk, 2 tablespoons (half of the 1/4 cup) of the vinegar, the garlic, dill, 1 tsp of salt, and the pepper as well. Whisk to combine and set aside. When the potatoes are finished cooking, drain them in a colander and let sit for a couple minutes so they dry off well. At this point, pour them out onto a rimmed baking sheet. When the potatoes are hot they are ready and willing to absorb tons of flavor. This is why partially dressing them when they are still steaming is a good idea. They will take on the sharp bite of the Dijon and vinegar. After the 30 minutes are up, simply toss the cooled potatoes in the dressing, cover, and refrigerate until you are ready to serve! P.S. Social media plug: Don’t forget to follow us on Facebook, https://www.facebook.com/ourlittleredkitchen, and on Instagram, @thelittleredkitchen!